Autoimmune diseases can be reduced or even prevented if proinflammatory immune responses are appropriately down-regulated. Receptors (such as CTLA-4), cytokines (such as TGF-β), and specialized cells (such as CD4+CD25+ T regulatory cells) work together to keep immune responses in check. T cell Ig mucin (Tim) family proteins are key regulators of inflammation, providing an inhibitory signal that dampens proinflammatory responses and thereby reducing autoimmune and allergic responses. We show in this study that reducing Tim-3 signaling during the innate immune response to viral infection in BALB/c mice reduces CD80 costimulatory molecule expression on mast cells and macrophages and reduces innate CTLA-4 levels in CD4+ T cells, resulting in decreased T regulatory cell populations and increased inflammatory heart disease. These results indicate that regulation of inflammation in the heart begins during innate immunity and that Tim-3 signaling on cells of the innate immune system critically influences regulation of the adaptive immune response. Antigen presentation during innate immunity influences the development of the adaptive immune response. The costimulatory molecules CD80 (B7-1) and CD86 (B7-2) on APC bind both CD28 and the regulatory molecule CTLA-4. CTLA-4 down-regulates T cells by mechanisms that include TGF-β and transcription factor forkhead box p3 (Foxp3)3 expression, T regulatory cell (Treg) induction, and reverse signaling via CD80 and CD86 on APC (1, 2). CTLA-4-deficient mice spontaneously develop a lymphoproliferative autoimmune response, with particularly severe pancreatitis and myocarditis (3). Coxsackievirus B3 (CVB3) infection of susceptible BALB/c mice produces inflammatory heart disease that is similar to the disease observed in humans, with development of acute myocarditis from days 7 to 14 postinfection (p.i.) that progresses to chronic myocarditis and dilated cardiomyopathy (4). The family of genes encoding T cell Ig mucin (Tim) proteins reside in syntenic chromosomal regions (5q33.2 in human; 11B1.1 in mouse) that are linked to susceptibility to allergy and autoimmune diseases (5). Tim-3 is highly expressed on differentiated Th1 cells, with lower levels on monocytes, NK, and NKT cells (6, 7, 8). Treatment of mice with Abs that block Tim-3 (anti-Tim-3) in a mouse model of multiple sclerosis leads to hyperacute disease with increased numbers of neutrophils and macrophages and greater demyelination (5, 7, 9, 10), showing that Tim-3 is important in decreasing inflammation (5). Although it is believed that Tim-3 induces tolerance by down-regulating inflammation, the precise mechanisms are less clear. Male BALB/cJ (BALB/c) mice (6–8 wk old) (The Jackson Laboratory) were inoculated i.p. with 103 PFU of a heart-passaged stock of CVB3 (Nancy strain; American Type Culture Collection) or control PBS on day 0 and examined at 30 min or 6 h (innate response) or at day 10 or 12 p.i. for myocarditis (acute response) (11). Mice also received one i.p. injection of 100 μg of anti-Fc (clone 93; eBioScience) to reduce nonspecific binding and either 100 μg of anti-Tim-3-blocking Ab (clone 8B.2C12; eBioScience) or control IgG (catalog no. 16-4301; eBioScience) on day 0. Mice were maintained under pathogen-free conditions in the animal facility at Johns Hopkins School of Medicine, and approval was obtained from the Animal Care and Use Committee of the Johns Hopkins University for all procedures. Mast cells (MC) and macrophages were separated from heart cells, splenocytes, or peritoneal lavage cells using anti-CD117, anti-FITC, or anti-CD45 (eBioScience; clone 30-F11) paramagnetic beads on a magnetic column (Miltenyi Biotec), as described previously (11). MC and macrophages comprise ∼6% of the cells isolated from the heart at 6 h p.i., a number similar to the level in uninfected or PBS inoculated mice. Cells were stained with the following mAbs (eBioScience) diluted in 1% FBS in PBS: CD3 (total T cells, clone 17A2), CD4 (CD4 T cells, clone GK1.5), CD117 (MC, clone ACK2), F4/80 (macrophages, clone BM8), CD11b (macrophages and neutrophils, clone M1/70), B220 (B cells, clone RA3-6B2), Tim-3 (clone 8B.2C12), CD80 (B7-1, clone 16-10A1), CD86 (B7-2, clone GL1), I-AD (MHC class II, clone AMS-32.1; BD Pharmingen), CD152 (CTLA-4, clone UC10-4B9), CD25 (clone PC61.5), Foxp3 (clone FJK-165), and CD28 (clone 37.51). For intracellular staining, cells were fixed and permeabilized using a BD Cytofix/Cytoperm or anti-mouse Foxp3 staining kit (BD Pharmingen). Cell fluorescence was measured using a FACSCalibur flow cytometer, and data were analyzed using CellQuest software (BD Biosciences). Immune cells were collected by flushing the peritoneal cavity with 1% BSA in PBS at 30 min or 6 h after CVB3 i.p. infection and compared with PBS, uninfected controls at 0 h. MC and macrophages from the peritoneum were separated using paramagnetic beads and labeled using FITC CD117 or F4/80 (green fluorescence). Biotinylated anti-Tim-3 mAb were labeled with Alexa-555 (red fluorescence) (Molecular Probes), and cells were visualized using a Nikon E800 Microscope. Images were recorded with a 5-MHz Black and White CCD MicroMAX Camera (Princeton Instruments) and analyzed with MetaMorph Software (Universal Imaging). Cytokines were examined using Quantikine ELISA kits (R&D Systems) according to the manufacturer’s instructions, as described previously (11). Our laboratory has recently shown that myocarditis and chronic heart failure in mice is influenced by macrophage and neutrophil infiltration, cardiac fibrosis, and CD4+CD25+ T cell populations (11, 12, 13). Because Tim-3 influences macrophage and neutrophil populations and the development of organ-specific autoimmune diseases, we investigated whether Tim-3 alters CVB3-induced myocarditis. Because tolerance to myocarditis can be broken by administering LPS during the innate immune response to CVB3 infection (14, 15), we blocked Tim-3 during the innate immune response. Mice received only one 100-μg dose of anti-Tim-3-blocking or isotype control IgG Ab i.p. at day 0 of CVB3 infection, and myocarditis was assessed on day 12 p.i. Anti-Tim-3 treatment during the innate immune response to CVB3 significantly increased acute myocarditis at day 12 p.i. (Fig. 1⇓A). Histochemical staining revealed an increased mixed lymphocytic infiltrate in the myocardium of mice treated with anti-Tim-3 compared with controls (Fig. 1⇓, B and C). The fact that a single treatment with anti-Tim-3 during the innate immune response significantly increased acute myocarditis indicates the critical role Tim-3 plays during the innate immune response in regulating the progression to inflammatory heart disease. Anti-Tim-3 increases myocarditis. A, BALB/c mice were inoculated with anti-Tim-3 (aTIM3), isotype control IgG Ab (ISO), or PBS control at day 0 of CVB3 infection. Myocarditis was assessed on day 12 as the percentage of the heart with inflammation compared with the overall size of the heart and shown as the mean ± SEM. B–C, Tissues were fixed with formalin and stained with H & E. Original magnification, ×20. B, Histopathology of isotype control IgG-treated mice. C, Histopathology of anti-Tim-3-treated mice. Experiments were repeated three times with five to seven mice per group. ∗, p < 0.05. Tim-3 is expressed on monocytes at low levels and highly expressed on Th1 cells after three to four rounds of in vitro stimulation (6, 7, 8). However, Tim-3 expression on APC during the innate immune response to infection has not been previously examined. In this study, we confirmed Tim-3 expression on MC and macrophages obtained from the peritoneum 30 min after CVB3 infection by observing colocalization of Tim-3 with cell-specific Abs using fluorescence microscopy (Fig. 2⇓A). At 6 h p.i., Tim-3 levels were increased on MC (Fig. 2⇓, B and C) and macrophages (data not shown) isolated from the heart (Fig. 2⇓, B and C), spleen, or peritoneum (data not shown) compared with uninfected controls by FACS analysis. To our knowledge Tim-3 has not been reported to be expressed on MC. The costimulatory molecules CD80 and CD86, and MHC class II were also increased on MC (Fig. 2⇓C) and macrophages (data not shown) isolated from the heart at 6 h p.i., indicating that MC can serve as APC during CVB3 infection. Similar increases in the expression of Tim-3, CD80, CD86, and MHC class II were observed on MC and macrophages from the spleen at 6 h p.i. (data not shown). We also observed Tim-3 on the vesicles of degranulating MC following CVB3 infection by fluorescence microscopy (Fig. 2⇓D), and a global increase in cytokines in the heart at 6 h p.i. (Fig. 2⇓E). MC are known to release an array of preformed and secreted mediators after activation, including cytokines, that may directly influence the function of the adaptive immune response (15, 16, 17). Our results provide evidence that MC may be important immunoregulatory cells during the initiation of immune responses. Tim-3 expression is increased on APC 6 h after CVB3 infection. A, Peritoneal MC (FITC-CD117) or macrophages (Mac; FITC-F4/80) (green, left column) were costained with Alexa-555 (red, middle column). Merged images (yellow, right column) show colocalization of CD117 or F4/80 with Tim-3 on the surface of cells 30 min after infection. B, Tim-3 expression (solid red line) is increased on peritoneal MC 6 h after infection by FACS analysis compared with uninfected (filled line) and isotype controls (fine blue line). C, MC were isolated from the heart, and the expression level (% cells) of Tim-3, CD80, CD86, or MHC class II (IAD) was analyzed by FACS. Expression levels of PBS inoculated, uninfected controls (un) were compared with CVB3-inoculated BALB/c mice 6 h (6h) after infection. D, Degranulation of peritoneal MC stained with CD117 (green) and Tim-3 (red) 30 min after CVB3 infection showing vesicles with Tim-3 (arrow). E, Cytokine levels (pg/g of heart) were measured by ELISA from heart homogenates at 6 h after infection and compared with uninfected controls (un) and shown as the mean ± SEM. ∗, p < 0.05; ∗∗, p < 0.01; ∗∗∗, p < 0.001. Data represent one of three separate experiments using five to seven mice per group. To investigate innate immune mechanisms that lead to increased myocarditis after a single anti-Tim-3 treatment (Fig. 1⇑), we examined the level of CD80 and CD86 on APC from the heart or spleen, and CTLA-4 (intracellular) and CD28 (surface) levels on CD4+ T cells from the spleen at 6 h p.i. There is no inflammatory infiltrate in the heart at 6 h p.i., and so T cells are not present in the heart to analyze by FACS. 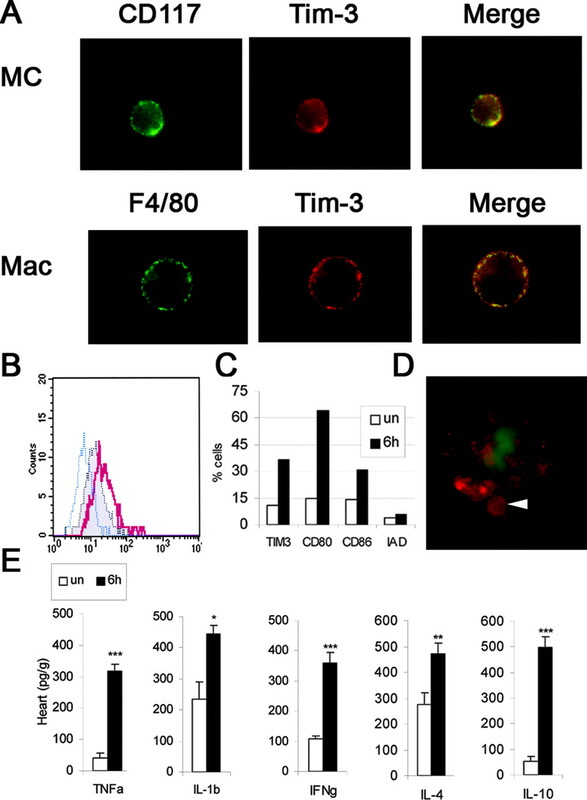 We found that anti-Tim-3 administered during the innate immune response partially blocked Tim-3 expression and reduced CD80 levels on MC and macrophages isolated from the heart or spleen at 6 h p.i. compared with isotype controls (Fig. 3⇓A). CD80 levels were most profoundly reduced by anti-Tim-3 treatment on APC in the heart, compared with the spleen (Fig. 3⇓A). In contrast, anti-Tim-3 had little effect on MHC class II or CD86 levels on MC or macrophages (Fig. 3⇓A), which were expressed at levels similar to those induced by CVB3 infection alone (Fig. 2⇑C). Reducing Tim-3 expression on APC resulted in reduced intracellular CTLA-4 levels in CD4+ T cells from the spleen, whereas CD28 levels were increased on CD4+ T cells at 6 h p.i. (Fig. 3⇓B). Our results suggest an interaction of CD80 with CTLA-4, and CD86 with CD28 (Fig. 3⇓). Although there are many conflicting reports (18), it has been suggested that the interaction of CD86 with CD28 dominates during costimulation, whereas CD80 and CTLA-4 govern negative signaling (19, 20). The interaction between CD80 and CTLA-4 is one of the highest affinities described for cell surface molecules (21), and CD80 transgenic mice exhibit markedly impaired immune responses–consistent with the ability of CD80 to bind to CTLA-4 (21, 22). Blocking CD80 results in increased CD4+ T cell proliferation and impaired Treg function (23). Furthermore, blocking CTLA-4 increases experimental autoimmune encephalomyelitis, diabetes, and other organ-specific autoimmune diseases, whereas even a single injection of CTLA-4-Ig induces tolerance if the Ab is administered during the first few days of disease induction (18, 19). Anti-Tim-3 reduces CD80 and CTLA-4 levels during the innate immune response. BALB/c mice were inoculated with anti-Tim-3 (aTIM3) or isotype control IgG Ab (ISO) at day 0 of CVB3 infection. 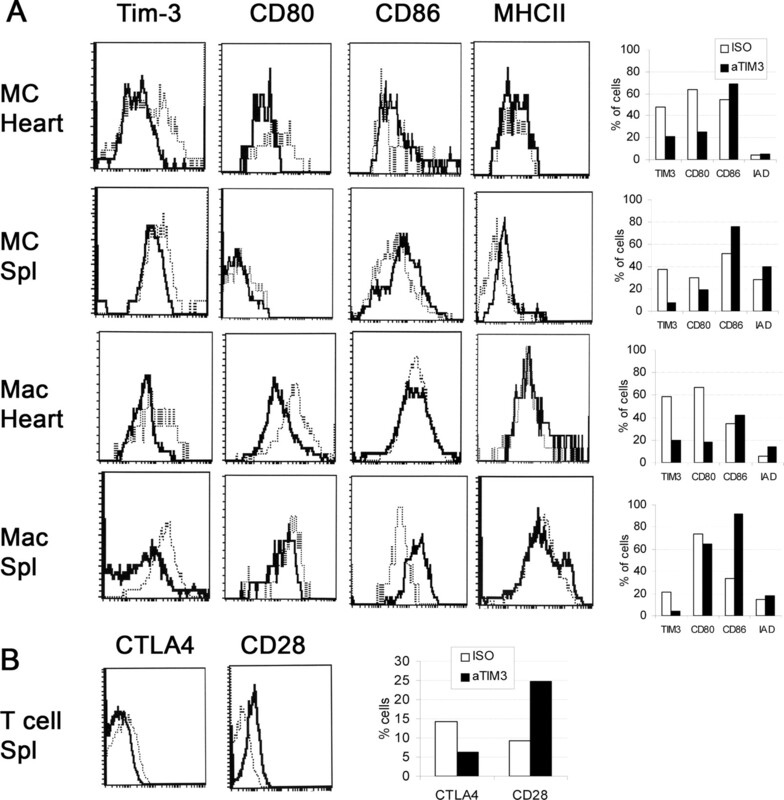 A, MC and macrophages (Mac) were isolated from the heart or spleen (Spl), and the expression level (% cells) of Tim-3, CD80, CD86, or MHC class II (MHCII or IAD) was analyzed by FACS. Expression levels of ISO (fine lines and white bars) are compared with anti-Tim-3-treated (aTIM3, heavy lines and black bars) BALB/c mice at 6 h. B, Expression levels of CTLA-4 (intracellular) or CD28 (surface) were assessed on CD4+ T cells from the spleen 6 h after CVB3 infection. Data represent one of three separate experiments using five to seven mice per group. To determine whether reducing Tim-3 expression during the innate immune response alters Treg function during acute myocarditis, we examined the level of Treg populations in the heart. We found increased inflammation in the heart in anti-Tim-3-treated mice by FACS analysis (Fig. 4⇓A), similar to results obtained by histology (Fig. 1⇑). Examination of the inflammatory infiltrate of anti-Tim-3-treated mice revealed increased numbers of CD11b+ cells (Fig. 4⇓B), such as macrophages and neutrophils. In contrast, other immune cells in the heart were decreased in anti-Tim-3-treated mice during acute myocarditis (Fig. 4⇓B). Reducing Tim-3 expression during the innate immune response reduced the percentage of CD4+ T cells expressing CD25, Foxp3, or CTLA-4 (classical Treg) during acute myocarditis (Fig. 4⇓C), as well as reducing the percentage of other potentially regulatory CD4+ T cells such as those expressing Tim-3 (Fig. 4⇓C) (6, 9, 10). Thus, reducing Tim-3 levels during the innate immune response to CVB3 infection results in increased macrophages/neutrophils and reduced Treg populations in the heart during the adaptive immune response. Anti-Tim-3 increases macrophages/neutrophils and reduces Treg populations in the heart during acute myocarditis. A, BALB/c mice were inoculated with anti-Tim-3 (aTIM3) or isotype control IgG Ab (ISO) at day 0 of CVB3 infection. B, CD45+ immune cells were isolated from the heart during acute myocarditis, and individual cell populations were assessed by FACS analysis. C, Percentage of CD4+ T cells expressing Tim-3, CD25, Foxp3, CTLA-4, or coexpressing CD25 and Foxp3 (25 & FOX), or Tim-3 and CTLA-4 (T & CTLA4) by FACS analysis. Data represent one of at least three separate experiments using five to seven mice per group. Overall, these findings indicate that the regulatory effect of Tim-3 begins during the innate immune response. We demonstrate that Tim-3 signaling on MC and macrophages reduces inflammatory heart disease by altering CD80 and CTLA-4 levels during the innate immune response. Understanding how immune responses are regulated is critical for developing effective therapies to reduce or prevent allergy and autoimmune diseases. We thank L. Meszler and L. Blosser for technical assistance. ↵1 This work was supported by National Institutes of Health Grants HL67290, HL70729, AI51835, ES03819, and T32 ES07141 (to J.F.N.). ↵3 Abbreviations used in this paper: Foxp3, forkhead box p3; Treg, T regulatory cell; CVB3, coxsackievirus B3; p.i., postinfection; Tim, T cell Ig mucin; MC, mast cell. Chen, L.. 2004. Coinhibitory molecules of the B7-CD28 family in the control of T cell immunity. Nat. Rev. Immunol. 4: 336-347. Nelson, B. H.. 2004. IL-2, regulatory T cells, and tolerance. J. Immunol. 172: 3983-3988. Fairweather, D., N. R. Rose. 2005. Inflammatory heart disease: a role for cytokines. Lupus 14: 646-651. Wills-Karp, M., Y. Belkaid, C. L. Karp. 2003. I-Tim-izing the pathways of counterregulation. Nat. Immunol. 4: 1050-1052. Kuchroo, V. J., D. T. Umetsu, R. H. DeKruyff, G. J. Freeman. 2003. The TIM gene family: emerging roles in immunity and disease. Nat. Rev. Immunol. 3: 454-462. Monney, L., C. A. Sabatos, J. L. Gaglia, A. Ryu, H. Waldner, T. Chernova, S. Manning, E. A. Greenfield, A. J. Coyle, R. A. Sobel, et al 2002. Th1-specific cell surface protein Tim-3 regulates macrophage activation and the severity of autoimmune disease. Nature 415: 536-541. Sabatos, C. A., S. Chakravarti, E. Cha, A. Schubart, A. Sanchez-Fueyo, X. X. Zheng, A. J. Coyle, T. B. Strom, G. J. Freeman, V. J. Kuchroo. 2003. Interaction of Tim-3 and Tim-3 ligand regulates T helper type 1 responses and induction of peripheral tolerance. Nat. Immunol. 4: 1102-1110. Sanchez-Fueyo, A., J. Tian, D. Picarella, C. Domenig, X. X. Zheng, C. A. Sabatos, N. Manlongat, O. Bender, T. Kamradt, V. J. Kuchroo, et al 2003. Tim-3 inhibits T helper type 1-mediated auto- and alloimmune responses and promotes immunologic tolerance. Nat. Immunol. 4: 1093-1101. Fairweather, D., S. Frisancho-Kiss, S. A. Yusung, M. A. Barrett, S. E. Davis, R. A. Steele, S. J. Gatewood, N. R. Rose. 2005. IL-12 protects against coxsackievirus B3-induced myocarditis by increasing IFN-γ and macrophage and neutrophil populations in the heart. J. Immunol. 174: 261-269. Fairweather, D., S. Frisancho-Kiss, S. A. Yusung, M. A. Barrett, S. J. L. Gatewood, S. E. Davis, D. B. Njoku, N. R. Rose. 2004. IFN-γ protects against chronic viral myocarditis by reducing mast cell degranulation, fibrosis, and the profibrotic cytokines TGF-β1, IL-1β, and IL-4 in the heart. Am. J. Pathol. 165: 1883-1894. Afanasyeva, M., D. Georgakopoulos, D. F. Belardi, D. Bedja, D. Fairweather, Y. Wang, Z. Kaya, K. L. Gabrielson, E. R. Rodriguez, P. Caturegli, et al 2005. Impaired up-regulation of CD25 on CD4+ T cells in IFN-γ knockout mice is associated with progression of myocarditis to heart failure. Proc. Natl. Acad. Sci. USA 102: 180-185. Lane, J. R., D. A. Neumann, A. LaFond-Walker, A. Herskowitz, N. R. Rose. 1991. LPS promotes CB3-induced myocarditis in resistant B10.A mice. Cell. Immunol. 136: 219-233. Fairweather, D., S. Frisancho-Kiss, N. R. Rose. 2005. Viruses as adjuvants for autoimmunity: evidence from coxsackievirus-induced myocarditis. Rev. Med. Virol. 15: 17-27. Fairweather, D., S. Frisancho-Kiss, S. Gatewood, D. Njoku, R. Steele, M. Barrett, N. R. Rose. 2004. Mast cells and innate cytokines are associated with susceptibility to autoimmune heart disease following coxsackievirus B3 infection. Autoimmunity 37: 131-145. Galli, S. J., S. Nakae, M. Tsai. 2005. Mast cells in the development of adaptive immune responses. Nat. Immunol. 6: 135-142. Bugeon, L., M. J. Dallman. 2000. Costimulation of T cells. Am. J. Resp. Crit. Care Med. 162: S164-S168. Sansom, D. M., C. N. Manzotti, Y. Zheng. 2003. What’s the difference between CD80 and CD86?. Trends Immunol. 24: 313-318. Collins, A. V., D. W. Brodie, R. J. C. Gilbert, A. Iaboni, R. Manso-Sancho, B. Walse, D. I. Stuart, P. A. van der Merwe, S. J. Davis. 2002. The interaction properties of costimulatory molecules revisited. Immunity 17: 201-210. Sethna, M., L. van Parijs, A. H. Sharpe, A. K. Abbas, G. J. Freeman. 1994. A negative regulatory function of B7 revealed in B7-1 transgenic mice. Immunity 1: 415-421.